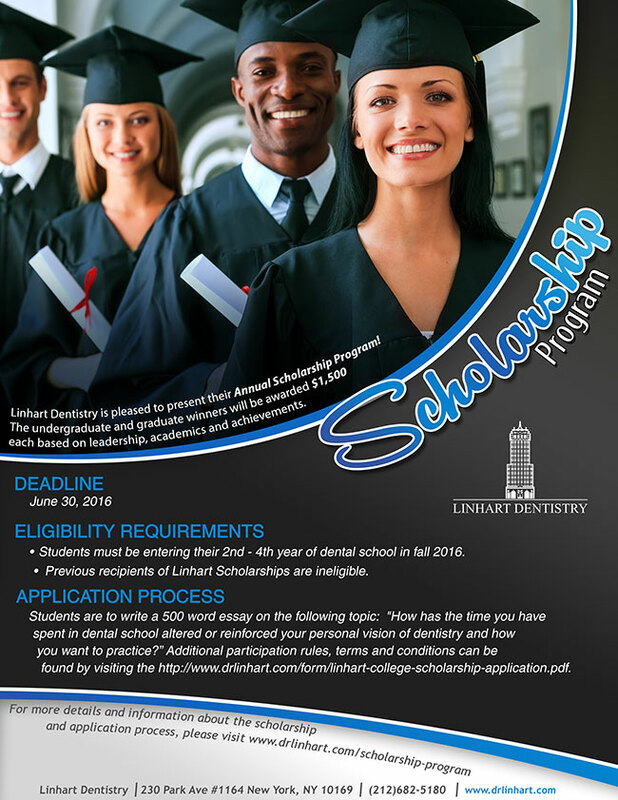 Linhart Dentistry is pleased to announce that it has launched a dental scholarship program for the 2016-2017 academic year. The dentistry scholarship is intended to support dental school students and the winner will receive $1,500. New York, NY (THE WIRE PRESS) – For students who are in at least their second year of dental school, Linhart Dentistry is offering a dentistry scholarship in the amount of $1,500. Scheduled for the 2016-2017 academic year, the scholarship is an ongoing effort by the dental office to encourage students who wish to enter the dental care field. Achievements, academics and leadership will be examined to determine the recipient of the dental scholarship. Previous recipients of the scholarship are not eligible to apply. Additionally, students will need to submit a 500-word essay on “How has the time you have spent in dental school altered or reinforced your personal vision of dentistry and how you want to practice?” The essay should show that the student has a deep understanding of the topic, a clear stance and opinion and a focused and well-reasoning tone. The dental scholarship essay must be double-spaced, typed, no more than 500 words and emailed, along with the application and other materials, to scholarship(at)drlinhart(dot).com. Dr. Linhart and his father, Dr. Jan Linhart, will be reviewing the essays, which must be received by June 30, 2016. For more information on the dentistry scholarship, please go to http://www.drlinhart.com/form/linhart-college-scholarship-application.pdf.